Jacob joined scouts at the age of 13, Jacob enjoyed his time in scouts and as his leadership skills grew he became a patrol leader. In 2007 Jacob was awarded Scout of the year. Over the next three years he moved up to 28th Glen Eira venturer unit, where he helped build and run a successful program with his fellow unit members. At the age of 19 Jacob decided he would like to give back to the wonderful world of scouting and so he signed up to become a scout leader. Running Scout nights alongside the other leaders Jacob helped ensure the youth members had fun while learning scouting skills. During his time volunteering in the scout section for a short time Jacob was also assisting to run programs in the cub section. As the group continued to grow, so did the scouting sections. 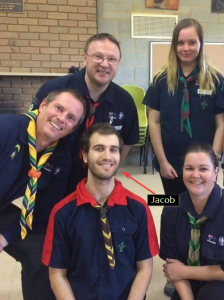 Jacobs next chapter within leading in scouts moved to the Joey section where he contributed running scouting arts and craft nights for 10th Caulfield youngest members aged between 6-8 years old. Now Jacob has decided his adventures will continue in the Cub Scout section.